Ah yes, this is what higher education produces anymore… morons. 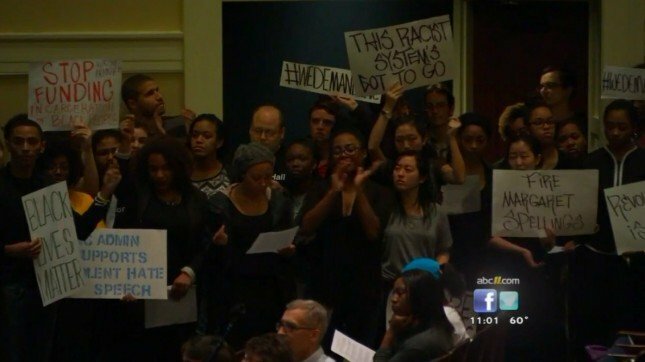 These people at the University of North Carolina Chapel Hill let 50 radical students waltz in and take over a town hall meeting. They took up an hour of the two hour format to read a list of 50 racist demands. The demand list was entitled, “A Collective Response to Anti-Blackness.” They called the university an unethical institution that is run by white supremacist, patriarchal capitalism that treats minorities as “less than essential to the everyday running of UNC.” Give me a freaking break! If they don’t like it, they can go somewhere else. They won’t be happy until only black students and officials control everything. These are revolutionaries and this was what I consider a radical, terrorist type of stunt. A large group of students from the University of North Carolina Chapel Hill marched into and took over their school’s “town hall” meeting on race relations Thursday evening, using an hour of the two-hour forum to read off a list of 50 demands. But one student who attended the meeting wasn’t keen on the entire list. 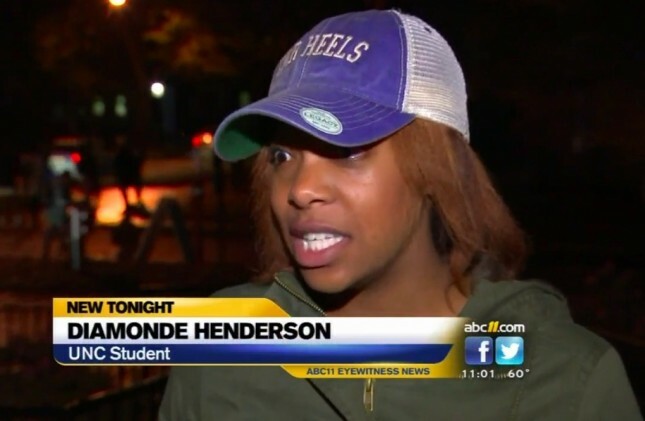 ”I don’t think you should be making demands if they’re not feasible,” Diamonde Henderson told WTVD-TV. Henderson also was put off that the group took half the meeting time as some attendees could have been left out. ”The purpose of it was so everyone could share all of their ideas,” she told the station. They want free tuition, they want the new president gone, they want surveillance gone and Confederate monuments removed. This is all bull crap. Education is something you earn and pay for just like the rest of have done. Confederate monuments are not racist, they are cultural. And if I were a thug, I’d want surveillance taken out as well. So, they are there to take what is theirs? They are going to tear it down. Suspend them immediately and if they come back, arrest them. That’s what should be done, instead the faculty are coddling them and being uber politically correct. It’s sickening and dangerous. These students are allowed to attend that university. They are not in a position to demand anything. What a bunch of spoiled, racist brats egged on by hippie, communist radicals.